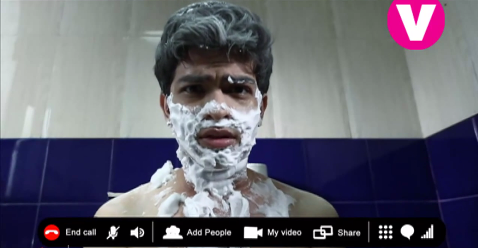 The story starts with a boy named Cheeku all messed up in his bathroom. He recalls the ‘bad’ events that took place earlier in his day and starts telling them. He first introduces himself as a guy stuck between his elder and younger brother. He scares facing people, talking with them, expressing himself, basically scares from everything. He introduces his brothers. The younger one is, Dodo, and the elder one is, Sid. everyone, but is like a puppy in front of his girlfriend. Sid’s girlfriend asks him what’s special today? Sid says, it’s 29th April. He goes in the bathroom. Cheeku feels something special is going to happen in his life today, but he can’t remember what. He’s trying to remember, and just then, their maid comes to clean the room. Cheeku is thinking looking at the maid. The maid misunderstands and thinks he’s staring with bad intentions. She leaves. Cheeku asks Dodo what special is going to happen for him today. Dodo makes fun of him saying his best friend will leave him, but he has no friends. Or their mum will make breakfast…. which he doesn’t like. Cheeku tries to remember what’s today. Dodo says it’s bad day, no girl is taking shower with their window open. Cheeku says that’s so disgusting. Dodo says, right. Enough of watching girls like this. He will just say it all out today. 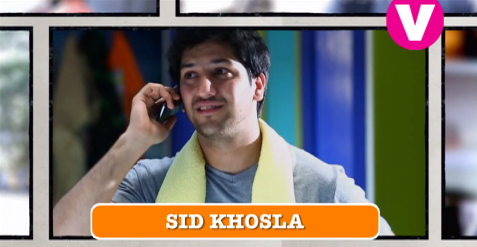 Cheeku needs to go to toilet badly, but Sid is inside, still talking to his girlfriend. Cheeku requests Dodo to let him go next. Dodo says he will let him go only if he writes a poem for him as his nature won’t let him write any good poem for a girl. Cheeku feels like refusing, but has no choice. Dodo is checking Cheeku’s things. Cheeku tells him not to touch his stuff and remove Sid from bathroom. Dodo asks him what he keeps writing in code language, and what he has wrote 29th April , call with K, else will never get her. Cheeku finally remembers he has a video call with a girl today. Cheeku’s mum calls him outside. Cheeku comes out and tells his mum that he was going to come after going to toilet. His mum tells him that the maid complained about him. Cheeku is shocked as he never looked at her with any bad intention, but he doesn’t defend himself. He just tells the maid that this won’t happen next time. He comes back to his room and is stopped by Sid. Sid tells him it’s good that he got no girlfriend. He then remembers that Cheeku got no friends. He tells him that if he looks at Cheeku’s life, then even his bad days seem average to him. Sid leaves. Cheeku rushes to the bathroom, but Dodo is inside now. He asks Dodo to come out if he wants his poem. Dodo comes out and Cheeku goes in. Cheeku remembers about the girl convincing him for video chat, but him saying no as they have to know each other well first. The girl says they are not getting married! She finds him very cute. Cheeku then remembers him telling her that he’s ready now. The girl says her exams are finishing on 29th, so that is the day. He hears his mum calling him for breakfast. He comes out for breakfast. He waves his hand, but all are busy eating. Cheeku’s dad tells all three to reach on time to their colleges/school. He leaves. Cheeku’s mum wants to check her emails today. She tells Sid, but Sid says he’s busy and asks Dodo. Dodo says he has exam coming up, so he takes Cheeku’s name. Cheeku says in his mind, those two keep spoiling his life. Today is the most important day of his life and they came to spoil it. His mum looks at him. Dodo says, he is also busy, but says okay as his mum doesn’t get sad. The three brothers are going to college on Cheeku’s bike, Anarkali. There is a scratch on it. Sid tells Cheeku that he has to look after Anarkali, but he has no girlfriend, so how would he understand Anarkali’s feelings. Cheeku says he does take care of Anarkali and environment as well. Dodo teases Cheeku saying he will get married to a tree, and that too on world environment day. Sid is pressing horn. Cheeku tells him to stop as it’s noise pollution. Sid asks what kind of horn is that and asks him to change it after college. Cheeku says there is no time today. Sid tells him to shut his mouth, he’s creating noise pollution. Both brothers laugh again. They are stopped by traffic police. Police fine them as they are not wearing helmet and three are on a bike. Both brothers make Cheeku pay. They finally arrive at their college. Cheeku is late. His teacher asks him to stand outside. She asks a question to class, and Cheeku answers. She lets him come inside then. Cheeku starts remembering the girl again and smiles. Dodo is outside his class, but Cheeku doesn’t notice. Cheeku remembers the girl telling him to come on video chat for sure else she will never meet him again. He says no way loudly. The teacher thinks he said that to her lecture and asks him to leave the class. Tum He dekh ke lagta hai aisa.. bhaad mein jaye ye duniya.. aur bhaad mein jaaye ye duniya dari. Dodo asks him to write something on her body. Cheeku’s teacher tells him she didn’t expect this from him. She scolds him. Cheeku doesn’t know what to say and in hurry, he messes it up more by saying “mam, I like you very much”. She stares at him. He says he meant he likes her class. She leaves from there. Dodo teases him saying first the maid and now the teacher, and then tells him that they will finish poem after college now. He leaves. Cheeku says he needs to take Anarkali to a mechanic as well. He is getting late for next class, so he runs. Sid and Dodo are waiting for Cheeku. They decide to take an auto. Sid says they will walk a block and then take. Dodo says they can find it from here too. Sid says he doesn’t take an auto in front of his college. Cheeku is at a mechanic’s shop. He is rehearing how he will talk to the girl. He’s going home and is again stopped by traffic police for speeding up. He requests him to let him go today as it’s a girl’s matter, he will surrender himself tomorrow. Police lets him go. He comes home and his mum takes him with her to check email. Cheeku says he thought everything will be done by 6 and he will get half an hour to prepare his room before his video call at 6 30, and here he’s getting late. He opens her account for her. His mum asks him to read it out for her. He says it’s all useless emails. She sees her name in one of the emails and insists him to read. Cheeku finally manages to leave from there, but now Sid comes on his way and asks why he didn’t change the horn. Cheeku says he will do tomorrow. Sid lets him go. Cheeku then can’t find a place to sit as Dodo is in his room and his mum is outside. He quietly goes in his bathroom. He gets everything ready and decides to freshen up. He’s shaving and some powder falls on him. He tries to wash his face, but water is not coming and it’s almost 6 30. He gets a video call and he accepts it. He sees a toy talking. He wonders if he was talking to her since 3 months? The girl finally comes on the camera and gets shocked seeing Cheeku like that. Cheeku, confused, scared, and shocked, just stands still there. Precap: Cheeku is trying to use his laptop, but Sid comes there and tells him not to do anything by which he will have to be ashamed. After Sid leaves, Dodo comes.